New York City, June 28, 2018 - At a time of #MeToo and women’s marches, the food industry is highlighting the role of women in driving food system innovation at the Summer Fancy Food Show with booths featuring women-owned companies and a panel discussion. Kuli Kuli, a women-owned company and America’s leading moringa brand, will be showcasing their new Moringa Green Smoothies at the Seeds&Chips Pavilion. Lisa Curtis, Kuli Kuli’s Founder & CEO will be speaking on Sunday July 1st at 12:15pm at the Excite Stage about Kuli Kuli’s innovative moringa product line. Leading health and wellness experts at the Sterling Rice Group, Good Morning America, and the popular wellness blog Well+Good have identified moringa as the top wellness trend of 2018. Kuli Kuli has seen over 200% growth within its line of moringa products, and is leveraging the power of the US market to fundamentally change the lives of women farmers. Known in ancient cultures as the “tree of life,” moringa is nutrient-dense and contains promising medicinal benefits. Moringa’s leaves are naturally rich in protein, iron, calcium, vitamins, and antioxidants, and provides a complete plant-protein with all nine essential amino acids. Kuli Kuli sources the highest-quality, organic, sustainably-grown moringa leaves from their network of family farmers and women-led cooperatives across the globe. Kuli Kuli’s products—Moringa Superfood Bars, Pure Organic Moringa Vegetable Powder, Organic Green Smoothie Mixes, and Moringa Green Energy shots—are sold in over 6,000 stores across the US, including Whole Foods Market, Sprouts, Safeway, and Amazon.com. Kuli Kuli’s moringa products make it easy for Americans to get their greens on the go while helping to plant moringa trees and support women farmers in the developing world. In less than five years on the market, Kuli Kuli has grown from an idea dreamed up in Peace Corps into a multi-million dollar social enterprise. We’ve worked hard to pioneer a global moringa supply chain with high safety and impact standards. 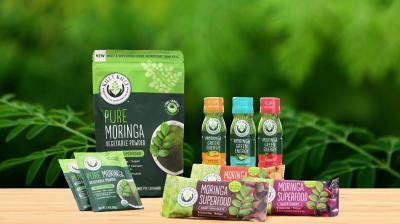 Kuli Kuli’s moringa products have won multiple awards and are sold in over 6,000 retail locations including Whole Foods Market, Sprouts and Safeway. Kuli Kuli has formed partnerships with leaders in the field, including Whole Foods Market, the Clinton Foundation, Timberland, Indiegogo and Kellogg. Our Pure Organic Moringa Powder is in the top 2% of all supplements sold by the largest natural food distributor in the country. In 2017, Kuli Kuli closed on a $4.25M Series A led by Kellogg’s venture capital arm, eighteen94 Capital. Moringa was recently named the top 2018 wellness trend by Good Morning America and the Sterling Rice Group. Kuli Kuli is headquartered in Oakland, CA and has ten full-time employees.